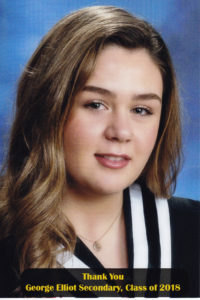 This year’s recipient of the Arnold Award is Cass Hannay, a recent graduate of the George Elliot Secondary School in Lake Country. Laura Neame, archivist of the Lake Country Museum, presented the Award. Cass’s ambition to become immersed into culture has helped her win this award. Her passion for history made her an exceptional choice as a recipient. Cass has a strong interest in history and is looking to pursue an education and career in direct relation with museums. Cass has big dreams to start a career, working at the renowned British Museum in London. The Arnold bursary will help her afford her education and a potential co-op position at the prestigious British Museum, if the opportunity arises. We are happy to help Cass’s dreams come true and support her drive, while furthering the progress towards her end goal. She plans to complete a Bachelor of Arts in History. Furthermore, she will continue to learn and experience Canadian culture from coast to coast. As the recipient of the Arnold Award, Cass Hannay follows: Alexandra McAllister (2017), Alex Ireland (2016), Lauren Kim (2015), Julie Klingner-Jardine (2014), Rebecca Watson (2013), Lucas Anderson (2012), Robert Abel (2011), Kayla Stinn (2010), Julianne Marriott (2009), Diane Kalis (2008), and Leland Crowther (2007). Lake Country Heritage and Cultural Society’s Arnold Award is named in honour of Jane and Gilbert Arnold, two Lake Country residents who contributed greatly to their community and specifically to the Lake Country Museum and Archives.